24th of November, 2016 - A puppy for Christmas? Please don't be tempted. Puppies for Christmas………please don’t be tempted. A puppy is never a good surprise gift, especially at Christmas. A cute puppy stumbling out of a pretty Christmas box is a frightened confused baby that has just been taken away from its siblings and mother at best or has been in a pet shop frightened, confused, and taken from its mother and siblings at for too young an age at worst. The holidays are the most inopportune time to have a puppy to take care of. The commitment to take care of such a young dog is pretty much twenty four hours a day for the first month or so and Christmas is just too busy and confusing for most people. Think about it. The first big obstacle is that the puppy has no idea just where it is supposed to do its toileting, so the new unprepared dog owner now has to set up the household to consistently teach the puppy where to ‘perform’ on Christmas Day with all of the relatives coming! This means lots of time committed to keeping an eye on the puppy when it is running around. 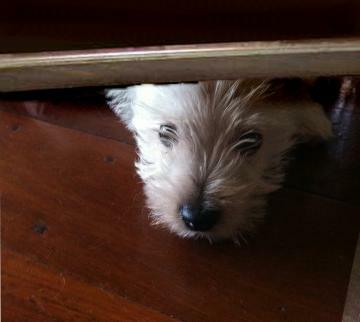 The puppy needs to be restricted to a smaller area until it is toilet trained. Try to buy a baby gate or two on Christmas day. Just how you want to spend the holiday, when the entire family will be there in four hours for a big sit down dinner. The household is different during the holidays. There are lots of people coming and going, there is unfamiliar noise, excitement, confusion, well intentioned relatives feeding the puppy food it has never had before so it gets an upset stomach, and there is a calm, quiet schedule missing to begin a new life in unfamiliar territory. Not the best start to a new life is it? There is a pine tree in the house perhaps with tinsel on it. Well tinsel, if swallowed by a puppy can kill them. Puppies really need a very calm, quiet environment where they can feel secure that the pack leader and decision maker (the new owner) is watching after them in their infancy to teach them the house rules. They need to know that there is a pack leader that will make sure they are safe. The pack leader will also be their provider and make sure they are well fed. The pack leader will also protect them from perceived danger so will let them know that everything is okay when they are frightened by remaining calm. The first few months of a puppy’s life will set the stage of their personality for life. We need to plan for this huge responsibility and holidays are just not the time to do that. Did you know that more than half of the puppies given as gifts for Christmas wind up in rescue shelters before their second birthday? How sad! Puppies are not toys to be given to children. They are living, loving, feeling creatures that need to be nurtured and guided throughout their life to be an important part of every family with no worry or responsibility. Remember, puppies will grow into mature adult dogs that will be with us for many years to come. We need to give them the best beginning as puppies to assure them the best worry free life that we can give. At Westie ReHoming we will not rehome a dog, young or adult over the Christmas period, and never rehome through a third party.